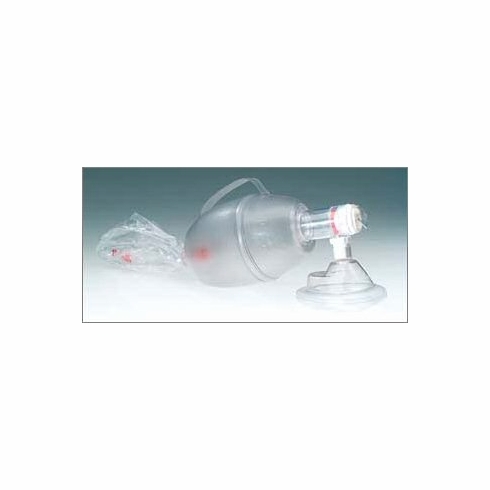 (4000):Adult Med-Rescuer BVM without pressure release valve. (4050):Adult Med-Rescuer BVM with pressure release valve. (4010):Child Med-Rescuer BVM with pressure release valve. (4025):Infant Med-Rescuer BVM with pressure release valve. Medication port for use with MDI or syringe. Manometer port. Integrated PEEP connection, no adapter necessary. Pressure release valve standard on child and infant models, optional on adult model. All models complete with reservoir bag and O2 tubing. Transparent bag (green) with positive textured grip and sensitive response. Range of accessories including 3M HEPA Filter and PEEP valve. Latex free. Disposable. Audlt, Child and Infant sizes.